Maybe you don’t believe in all that “personal development crap”. I get where you’re coming from. I think it’s relatively normal to be a skeptical, especially as a creative. And, through the ages, creatives have a history of being exploited. No wonder we’re always on guard. But if I decided not to share about personal development with you, I believe I would be doing you a major disservice. That’s because personal development has helped me overcome many mental blocks and obstacles. It’s gotten me to the point where my mind is quieter than it’s ever been and I’m able to act on what I say is important to me. Isn’t there something in your life you say you want to do, but you keep putting it off? What’s going on there? It’s not that you don’t know what to do. You probably know the exact steps you need to take. And yet, you’re stopped by something. That’s where personal development comes in. It has the potential to change all that. Some of the most popular posts on The Music Entrepreneur HQ website have to do with books. The stats show that people don’t do a whole lot of reading once they leave college or university. But maybe creatives are the exception. I personally know at least a few creatives who actively read to stimulate their mind and generate new ideas. So, maybe you don’t need to be told to read. Where you may be thwarted is in what to read. Now, any kind of reading is beneficial. It keeps your mind sharp. It makes you a better writer. And, it can help you generate new ideas. This is where growth happens. It’s okay if most of your reading is dominated by fiction. But consider adding a little bit of personal development material into the mix. Another great resource for personal development is audio. Podcasts, audio courses and audiobooks are the obvious place to look. You can subscribe to podcasts entirely for free, and there’s plenty of great content out there, regardless of what topic you’re interested in learning about. You can even listen to industry or competitor podcasts to get a sense of what’s going on in your niche and what your peers are up to. 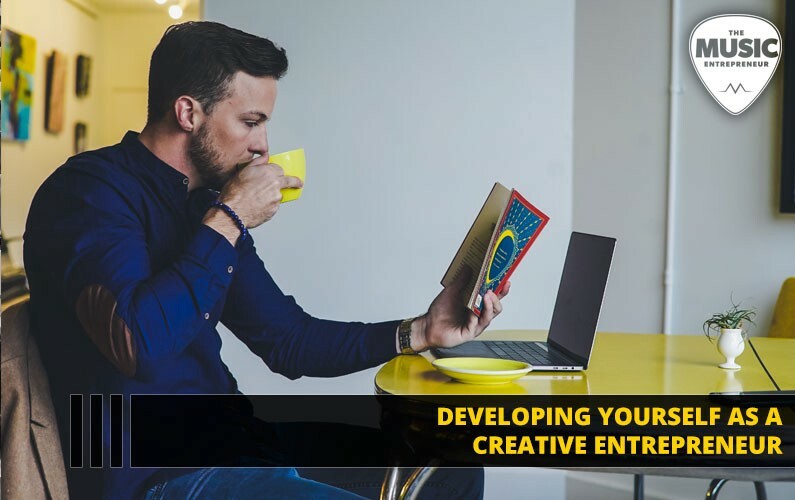 Audio courses can usually be found through independent providers — typically entrepreneurs, much like yourself, who are creating educational content to help people in their niche. Cost will vary, but most of this material is quite helpful. As for audiobooks, I recommend using a site like Audible, which is an Amazon-owned company that sells audiobooks. I think it’s best to read and listen to books, not just one or the other. But whether you want to buy audiobook versions of the books you already have or pick up books you don’t already own is up to you. There used to be a time when people would apprentice under a master to learn their craft. Students had mentors they could turn to when they didn’t understand something or needed some guidance. As an entrepreneur, you should have a mentor (or even a group of mentors) you can depend on. Don’t try to do it all alone. Don’t get stuck in your own head. I’ve made many poor decisions because I didn’t have a 360-degree view of what was happening in my business. If I had asked a few of my friends and mentors for their opinions, I probably could have avoided some of those mistakes. When you’re working hard, you can easily lose sight of what matters. This is especially true if you’re on the verge of burning out, or you’re already burnt out. So, don’t rely on your own brain for everything. Get guidance and feedback on an ongoing basis. Since mentors can see things you can’t, they can also help cause breakthrough in your business or career. Seek out mentorship. Find someone who’s accomplished things you’d like to accomplish and ask for their advice. Please go to events and conferences, and don’t get too caught up in what’s good or bad. You’ll figure that out as you go. Learning is all well and good. But if you don’t get into groups to learn from others, be present with them, and discuss and act on what you’ve been learning, it doesn’t do you much good. I’ll talk about why that is a little later. Some of my biggest breakthroughs have come as result of going to seminars. Sure, there are some books and podcasts that have had a huge impact on me. But of the hundreds of books I’ve read, there are only a dozen or so that made a difference. Of the thousands of podcast episodes I’ve listened to, I’d venture to guess it’s only a few dozen that made a real difference for me. Now, I’m not going to give up on books or podcasts. But it’s altogether too easy to hole up in your ivory tower and read books and listen to audio and think you’re making progress. Plus, it’s comfortable. Conferences and events, on the other hand, can shed light on what people have done with the material you’re learning, and how they got it out of their head into a form that lives in the real world. And, that’s the only place it lives. What you learn makes no difference unless it exists in the world. And, I’m sorry to be the one to break the news, but nothing that lives in your head lives in the world. Whatever is in your head is not real. This is the reason I encourage people to write their goals down with pen and paper. Once you’ve done this, your goals exist in a material sense. But they did not exist prior to you writing them down. So, act on what you learn. Test it out for yourself. Learning makes no difference unless it takes physical form. I used to think that personal development was all about more, better or different. But what I’ve discovered is that there is no breakthrough in more, better or different. You can improve a little bit every single day. But that doesn’t lead to quantum leaps in your personal growth or mindset. Doing more of something, doing it better or doing it differently is what you’ve been doing your whole life — and you may have seen some change. But I’m guessing you haven’t seen much breakthrough. I now believe that personal development is about clearing the space for what you want in your life. If you can’t seem to get started on something you know is important to you, it’s because there’s mental, emotional and/or physical clutter you need to unload. It’s because you need to cause completion in areas where you feel blocked and incomplete. Once you’ve made the space for it, creating new possibilities becomes easy. Originally published at www.musicentrepreneurhq.com on December 28, 2018.